Last week, Pre-K English was asked, “What makes you balanced?” The students, with a confused look, asked, “What is balanced?” They shared a few ideas such as yoga, skiing and hopping. The class stood up and practiced several poses to show themselves balanced and unbalanced. 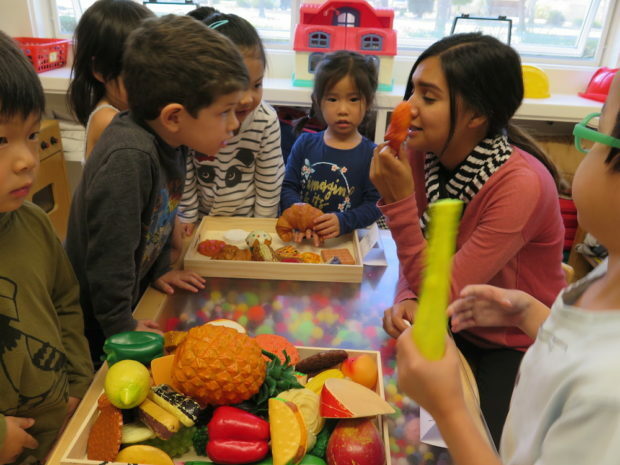 Many students said that eating fruits and vegetables (with a little bit of ice cream) made them balanced. The class continued their discussion by sorting healthy foods into one group and foods that were not as healthy into another group. 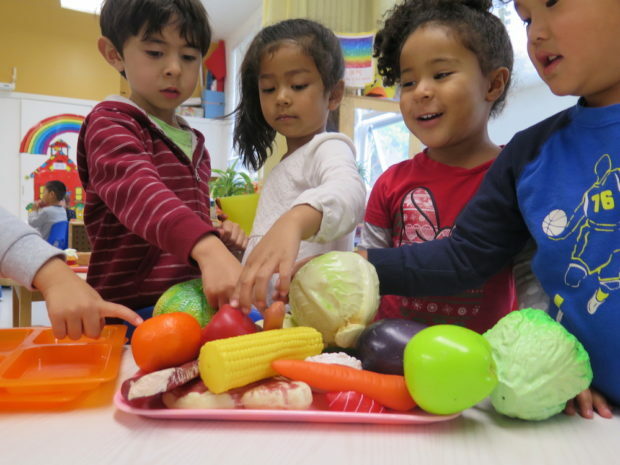 They discussed the beginning sounds of foods they enjoyed eating. Students then created a balanced meal and labeled their chosen foods with beginning sounds. 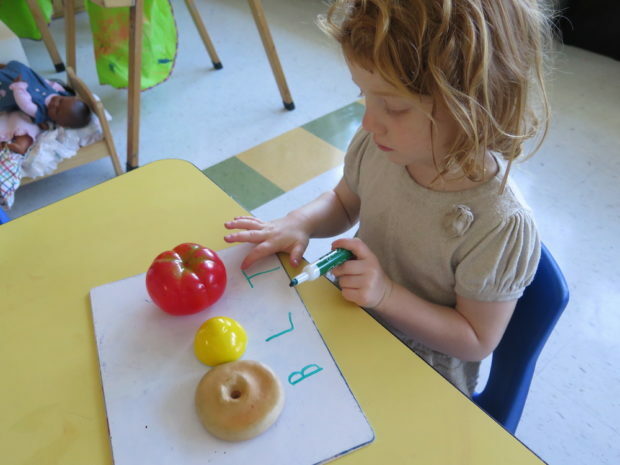 Towards the end of the week, Pre-K English started to understand that balanced meant a little bit of everything (a variety of foods, sleep, rest, play, reading, movement, etc.). Students continued to create their own vocabulary cards. By giving students ownership of their work, the learning experience becomes much more meaningful and rich. The students were first asked, “What is your favorite food?” or “What do you do for exercise?” The responses were then written on a vocabulary card and the students drew the corresponding picture. Each letter of the alphabet will contain many vocabulary cards to make a book that will help kids to recognize print and read the words that are already present in their lives. Pre-K English also engaged in several literacy centers. 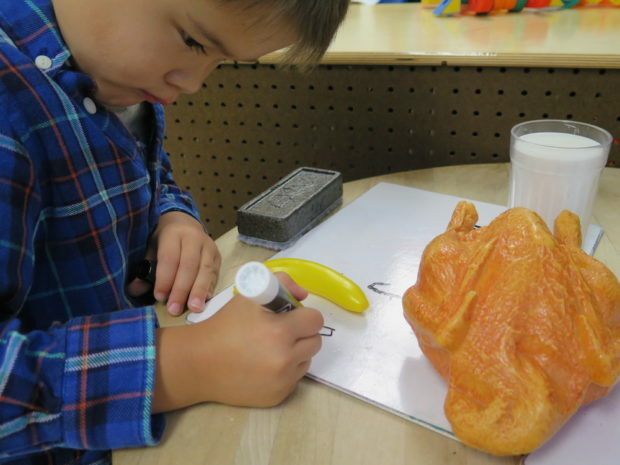 Students created their name with alphabet sponges, matched pictures with beginning sounds and practiced writing their name in uppercase and lowercase letters. For a technology component, the children used the iPads to play a matching game with a partner. The independent center allowed the children to open up the application on the iPad, use their thinking skills to play the matching game (similar to Memory) and take turns with a peer. As we journey through Taste Week, which is a school wide event, take time to cook together. Perhaps ask your child what they would like to prepare and eat. Take time to create a shopping list together, go shopping together and then prepare a delicious meal together! If your child would like to share the experience with their class, please feel free to document the process by taking photos and sending them to school throughout the week (label the photos PK English). This is completely optional as the focus is more on spending time creating a meal and enjoying each other’s company, but it would be a great communication opportunity for show and tell.